Now that you understand how the power of a penny can change a city, I bet you are ready to dream up some projects that will boost Oklahoma City’s growth for the next generation. Luckily for you, the City is soliciting feedback for the next round of MAPS. Mayor David Holt and the members of City Council are inviting everyone to submit ideas for a potential MAPS 4 at ideas4maps.com. The City is requesting that the ideas be transformational, specific things that will propel Oklahoma City forward. You can also submit your ideas on social media using the hashtag #ideas4maps or by mailing a letter to Mayor David Holt, Attn: MAPS 4, 200 N Walker Ave. 3rd floor, Oklahoma City, OK 73102. And just to settle any fears you might have: A new MAPS program would leave the current Oklahoma City sales tax rate of 4.125 percent unchanged. The Better Streets, Safer City temporary 1-cent sales tax that is helping to fund nearly $800 million in street repairs expires at the end of March 2020. If residents adopt a MAPS 4 plan this year, the overall sales tax rate in most of OKC would remain 8.625 percent (8.975 percent in Canadian County and 8.875 percent in Cleveland County because of county sales taxes). In November 2001, the MAPS for Kids program was established when Oklahoma City voters approved a new tax to fund public schools. The seven year temporary sales tax, combined with a $180 million bond issue, raised $700 million to fund transportation, technology and construction projects for the benefit of Oklahoma City’s public school students. With many of the larger construction projects complete, work continues at some schools throughout Oklahoma City. When the program comes to a close, more than 70 new and renovated schools totaling $470 million in construction will be completed. If you’ve spent anytime near downtown recently you know that something big is happening. That something big is the OKC Streetcar and we are just months away from launch day. That is right, this December you will be able to ride the OKC Streetcar throughout downtown. The Oklahoma City Streetcar will include five cars, each circulating to 22 stops along 4.8 miles of track, with an average time of 12 to 14 minutes between cars. Each car can carry 104 passengers through two main loops: a Bricktown loop and a Midtown-Business District-Automobile Alley cross-sectional. You can view a map of the routes here. The streetcar will be an affordable, accessible, convenient alternative for office commuters, convention attendees, tourists and others visiting our great city. A single trip will cost $1, and a day pass will be $3. Monthly passes will be $32 and an annual pass will cost $384. As of the beginning of July, 87 percent of track had been placed and 78 percent of stops had been completed. Six streetcars are currently in the maintenance facility with a seventh arriving at the end of October. Streetcar operation testing on the Bricktown loop is currently underway. Construction and adjustment is still ongoing in several locations. Specific road and lane closures through Sept. 1 can be found in this report from the City of Oklahoma City MAPS 3 site. General information for the OKC Streetcar can be found on the EMBARK Streetcar page or on the City of Oklahoma City’s MAPS 3 Streetcar page. You wanted it, you paid for it and now it’s time you got it. Keep your eyes on December: the OKC Streetcar is coming rail soon. We know we talk about the future of Oklahoma City a lot … like a ton. We just can’t help it. We’re excited because the next couple of years are going to take our beloved OKC to another level. With dirt now moving at the Downtown Park and Conventions Center, plus the streetcar being tested, big changes are coming to OKC. But words are just words. Even though we think we can spin a good yarn the saying that a picture is worth a thousand words rings pretty true. But if a picture is worth a thousand words how many words is a video of what downtown will look like in 2020 worth? Over the past decade, Oklahoma City has invested heavily in its trails system in an effort to remake the city and promote more healthy living. Oklahoma City’s first neighborhood trail opened in March as civic leaders cut the ribbon on the MAPS 3’s Will Rogers Trail. As the second of three trails funded by MAPS 3, Will Rogers Trail connects Lake Hefner with the Oklahoma River. The final of three MAPS 3-funded trails, at Lake Stanley Draper, broke ground this month. Outside of the newest additions to the trail system, Oklahoma City has many options throughout the metro that residents can choose from when looking for a nice exercise trail. The trail system of OKC currently has 10 intertwined trails stretching across the majority of the city. These trails include the Bert Cooper Trails, Earlywine Trail, Hefner-Overholser Trail, Katy Trail, Lightning Creek Trail, Overholser Trail, South Grand Trail, Tinker-Draper Trail and the West River Trail. Recreational activities abound around each of these trails, so the options are endless. The Bert Cooper Trails are located along Lake Hefner with easy access to the restaurants along the East Wharf, fishing docks, Stars & Stripes Park and the Lake Hefner Golf Course. The Overholser Trail is another trail with fun amenities including kayak and canoe rentals, a café, and even zip lines. If you are feeling really adventurous and sporty we recommend the Oklahoma River Trails. You can run and bike along the river and stop at OKC’s famed Boathouse District and grab a canoe or kayak. No matter your interests, Oklahoma City’s expanding trail system will give you a way to enjoy the great outdoors. The future is almost here. Excited yet? Last week, the first of seven streetcars came off the assembly line and will soon be painted and shipped to OKC. If you drive or do a bit of walking around Bricktown, you can see the freshly installed tracks where the streetcar will run. And, if you read or hear anything on the news about the streetcar, you can feel the palpable excitement OKCitians have for this groundbreaking project. The installation and soon-to-be operation of the streetcar reflects the growth of OKC’s downtown core as a result of the booming success of the other MAPS projects. In fact, the OKC Streetcar itself will be transformative, as many city leaders are expecting its installation to result in greater sales and property tax revenue for the city like similar installations in Kansas City. But, even more important than positive economic impact, the OKC Streetcar will have a positive influence on OKC’s culture for years to come. One of our best-known modern philosophers once admonished, “When you’re fifteen, and somebody tells you they love you, you’re gonna believe them.” In the case of the Chesapeake Arena, there’s no reason to doubt OKC’s genuineness. “Loud City,” the current home of the OKC Thunder and one of the centerpieces of the original set of MAPS projects, is also a great place to see a concert. We recommend taking a deep breath as you walk through the doors of the ‘Peake, because you’re sure to see some concerts that will leave you breathless. In fact, one of the senior boys winked at the arena right off the bat, with the legendary Paul McCartney playing one of the first shows back in 2002 and making our head spin around. The Chesapeake is ready to celebrate its 15th in style, with the former Beatle slated to return July 17, joining Kings of Leon, Lady Gaga, Linkin Park, Iron Maiden and more on the arena’s upcoming concert calendar. Check out more info here, and don’t mind us as we dance around the room when the night ends, when the night ends. It’s been a banner year for the upcoming OKC Streetcar system. 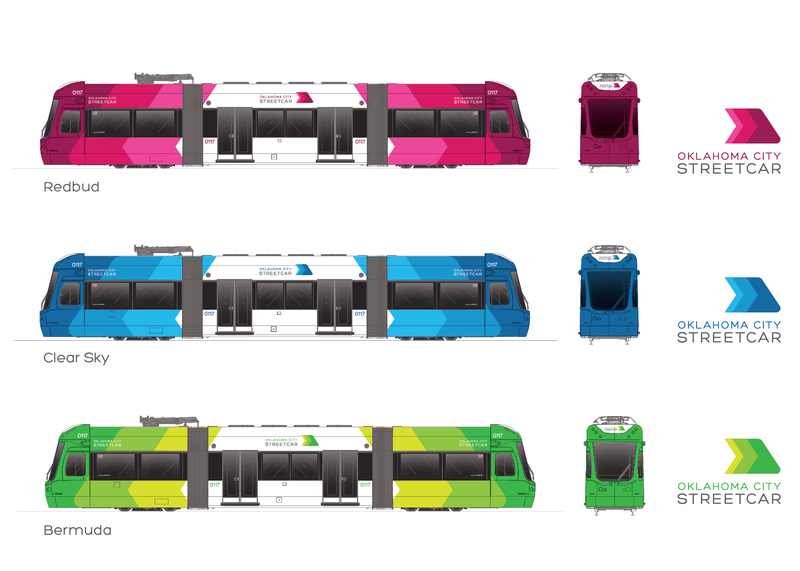 In addition to the release of the branding and colors, the City Council approved two routes for the initial system, the purchase of up to six streetcars from Brookville Equipment Corporation, and a contractor for the installation of the rails. Things are really “moving along” when it comes to the OKC Streetcar, and we can’t wait to start riding in 2018. Keep up with the MAPS 3 news archive on the City’s website.